Why not buy a copy for someone special or just treat yourself. The CD costs £5.00 or Download it for just £3.75, both include a donation of £3.50 to the Rainbow Trust Children’s Charity. The residual amounts cover production costs and transaction charges. All profits from the sale of ‘Inside My Heart’ go to the charity. Buy the CD or download it now and help the Rainbow Trust to support even more families. Inside my Heart is an inspiring and instantly memorable extract from the third movement of Will Todd’s “The City Garden”. 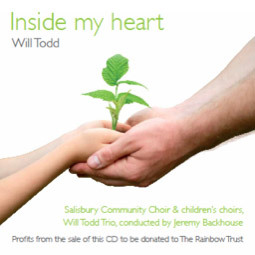 This Charity CD, was recorded by a group of over 300 adults and children from Salisbury choirs and schools, brought together by Salisbury Community Choir in this adventurous community project. Will Todd’s daughter Rowan, is a beautiful 9 year old girl who has been fighting a brain tumour for 5 years. This release is inspired by her and her fight against cancer and will raise funds for The Rainbow Trust, who are supporting her family through difficult times. The inspirational words and music in this song moved the choir to make this recording in support of The Rainbow Trust who provides practical and emotional support to families who have a child with life threatening or terminal illness.